"November 2...4...ah...821, Rochester approach, go ahead." Sigh. Yet another controller falls prey to my easily garbled tail number. "Warrior 2...1...4...8...1," I spell out slowly in my response, "is off Le Roy, one thousand eight hundred climbing eight thousand five hundred, VFR to papa kilo bravo. Request flight following." "November 821, squawk 7473 and ident. Say requested altitude." "We'll be cruising at eight thousand five hundred. Correction, the tail number is 2...1...4...8...1." "Roger, November 821. What is your aircraft type?" I share a look of frustration with Kristy in the back seat, fearing that we will be stuck answering to the wrong tail number all the way to Parkersburg, West Virginia. "Warrior 4...8...1 is a poppa two eight alpha slant uniform," I transmit back to the radar room at Rochester. "I think we have a new controller," I comment in a flat tone over the airplane's intercom. My wife's response is a bit sharper than I expect, "you think?" She may not be a pilot, may not have any desire to ever manipulate the controls of an aircraft, but she has listened to enough air traffic controllers in five years of flying right seat in Warrior 481 to recognize when a controller is not at the top of his or her game. Moments later, the controller breaks radio silence again. "Warrior 481, what's your full callsign?". We do not see my father and stepmother very often. They retired to Knoxville, TN several years ago and are not fond of long car trips. In fact, they did not leave the state at all in 2008. While this is their prerogative, it means that they have never met The Bear, their granddaughter, now 22 months old. Kristy and I decided that it was time to make an introduction in person. A car ride to Knoxville, TN from Rochester NY should require approximately twelve hours; twelve hours of an active toddler strapped into a car seat. I estimate that The Bear has never spent more than 1.5 hours in her car seat in one sitting and cannot imagine that she would tolerate much more than that. On the other hand, the Warrior is theoretically able to make the trip in 4.5 hours. And, in the airplane, The Bear can leave the restraints of her car seat to "move about the cabin" at cruise altitude. A flying trip was a no-brainer and flight planning quickly ensued. I planned a direct flight to Knoxville Downtown Island Airport (DKX), a destination so beloved by area pilots that it has over seventy positive comments on AirNav. By way of comparison, even the nicest airports generally inspire a mere dozen or two. Further review of airports along the way revealed the Mid-Ohio Valley Regional Airport in Parkersburg, West Virginia (PKB) and Big Sandy Regional in Prestonburg, Kentucky (K22) as good places to stop and eat. As with all things aviation, the weather at the time of the trip will make or break it. We planned (hoped) to make the trip on Good Friday, stay a couple of nights in Knoxville and return before sunset on Easter Sunday. Two days before Good Friday, it was obvious that a Friday departure was not going to happen. Severe storms moved through the south that day, impacting conditions around Knoxville. We held out hope for a Saturday morning departure. Saturday blossomed as a solidly marginal VFR day with plenty of turbulence and high winds sweeping across en route runways from unfavorable directions. Was it flyable? Yes. Legally flyable? Absolutely. Would there have been any margin for error or any chance of the flight being fun in any way? Nope. I called my Dad to cancel the trip. He is not the most expressive guy in the world, but I could hear the disappointment in his voice. Fortunately, my stepmother has a lot of general aviation experience as a passenger and completely understands how these go/no-go decisions work. I suspect that I owe her a lot of thanks for working in the background to make sure he did not take the cancellation personally. For my part, I resumed obsessive monitoring of the weather. Our next opportunity comes earlier than expected, the following weekend. The window is small: Friday April 17 to Saturday night, but it is enough. Weather in the Rochester area Saturday night will be the limiting factor, with a slight chance of rain. Forecasts indicate that the ceilings will probably remain high in Rochester, even if it rains. On Friday morning, we pack our gear (1 flight bag, 1 suitcase for Kristy and I, and 3 other bags of Bear Accessories) and depart for the Le Roy Airport. Kristy and The Bear wait in the warmth of Le Roy's terminal building while I do my pre-flight chores. With Warrior 481 ready to fly, I return to the terminal for my passengers. As they emerge from the terminal, Kristy says to me, "watch this." She points to the windsock and asks our 22 month old aviatrix, "what's that?" "Tock," my little girl replies with a grin. I grin back at my wife, impressed. "Who is going flying?" Kristy asks her. "Me," The Bear responds, prodding her chest for emphasis. "Who is going to fly the airplane?" "Me," The Bear answers with a grin. Trying another tack, my wife asks her, "who else is going to fly the plane?" The Bear's sparkling eyes turn to me. "Daddy!" she exclaims. "And where do we fly?" Our toddler dutifully points up. "Ky," she answers. With the Warrior packed, The Bear strapped into her car seat, and Kristy sitting in back next to our daughter, we launch into the crisp clear April air. Moments after departure, we contact Rochester approach for flight following to Parkersburg, West Virginia. After more back and forth than usual, we are eventually plugged into the national airspace system so that radar facilities from New York to halfway across the country can keep a watchful eye on our progress. As we fly southwest through New York, the landscape is uninspiring. It is a dead world below, with just a hint of green in some fields. The trees remain barren, reaching skeletal limbs skyward for want of warmth and sunlight. North of the Pennsylvania border, we fly over the Holiday Valley Ski Resort where snow still clings to the ski runs out of sheer defiance of the calendar. We cruise at eight thousand five hundred feet. Rochester approach passes us to Buffalo. As we approach the Pennsylvania state line, we are switched to Cleveland Center. Fortunately, the initial confusion over our tail number with the Rochester controller appears to be resolved and each subsequent controlling agency has our correct information. The Allegheny Reservoir straddles the New York - Pennsylvania border. Monitoring our progress on the sectional chart, I notice that a nearby VOR (VHF omnidirectional receiver) is the infamous "Broken Bra" VOR. I point this out to Kristy and hold the sectional chart over my shoulder for her to inspect (see below in the red box). At her quizzical look I suggest she speak the name of the VOR aloud. She does not give me the satisfaction, but rather sounds it out in her head and groans. I shrug, "hey, I didn't make it up." After talking to Cleveland Center on a couple of different frequencies, we are switched to Youngstown approach and, eventually, Pittsburgh. We fly directly over Pittsburgh's Class Bravo airspace. The Pittsburgh controller reminds me of one who retired from the Kalamazoo tower a few years earlier who was possessed with a distinctive clear voice and an unrushed attitude. I miss hearing his voice on the radio. With Pittsburgh dwindling behind us, we are back with Cleveland Center. Warrior 481 roughly parallels the Ohio River on the Ohio side. Within 30 minutes of our destination in Parkersburg, WV, we are switched to Indianapolis Center on 125.55 MHz. Twenty eight miles out from Parkersburg, I notify Indy Center that we are beginning a descent. "Roger, Warrior 481. Is this a brief stop? I show you going direct to Dekalb-Peachtree. Or is that just a typo?" Dekalb-Peachtree is a major airport (500+ operations per day) near Atlanta, Georgia. We are puzzled for a moment, then Kristy and I simultaneously remember the Rochester approach controller's penchant for aural dyslexia (the identifier for Parkersburg is PKB, Dekalb-Peachtree's is PDK). "It's a typo," I respond. "I thought so," the controller chuckles. "Will you be doing a gradual descent into Parkersburg or are you just stepping down to a lower altitude and leveling off?" "Warrior 481 is doing a gradual descent. I have an infant on board." "Very good," Indy Center replies approvingly. A few minutes later, the airport is in sight and we switch over to the Parkersburg tower. Absolutely nothing is happening at Parkersburg and we are soon cleared to land (below, photo by Kristy). Before I can shut the engine down, Jerry from the Mid-Ohio Valley Regional Airport is waiting by our wing to chock the wheels. This is fortunate because the ramp is sufficiently sloped that we would have started rolling backward once I released the brakes. Jerry offers to refuel the airplane (we accept) and gives us directions to the restaurant, Mary's Plane View. Mary's Plane View is located in the commercial air carrier terminal, an immaculate facility erected in 1976 whose architect clearly wanted it to appear "space aged". While such facilities tend to appear tired, dingy, and woefully dated in 2009, this one was in like-new condition; it literally sparkled. Sadly, it is underutilized. I learned from Jerry that commercial air traffic has significantly disappeared from Parkersburg over the years. The restaurant is nicely decorated and inviting, featuring a menu with the obligatory aviation-themed names for each dish. Kristy and I order sandwiches. The Bear tries stealing french fries from my plate and I wonder when and how she learned about french fries. They are not a staple at home. From our seats, we can easily see the windsock. It is twitchy; the wind direction is variable. "Tock!" The Bear exclaims proudly each time the sock moves. Aside from the skittish windsock, the only activity on the field is what appears to be a student pilot in a Cessna practicing stop and go landings. I leave the table early to pay the fuel bill and encounter another pilot in the general aviation terminal. "Awful day for flying, huh?" he begins the conversation with a classic opening. "Oh yeah," I nod, playing along. "Awful visibility, turbulence...just lousy." We share a grin between kindred spirits and part company. As I pay Jerry for the fuel, I notice the other pilot standing on the ramp using a handheld radio. Moments later, the Cessna that had been practicing during our meal lands, taxies to the ramp and shuts down long enough for the other fellow to climb aboard. The engine starts moments later and the Cessna taxies for departure. Stop and go landings...right seat passenger on a handheld...I suddenly realize that we probably just witnessed a first solo, the birth of a new pilot. Indeed, it is a good day to fly. After a nice rest for the adults, a diaper change for The Bear, and food for all three, we are ready to resume our journey to Knoxville. I call my Dad and tell him to expect us in two hours: 2:30 pm. It is much warmer in West Virginia than it was in New York. The climb to altitude is a bumpier one than we are accustomed to after so many months of cold weather flying. Finally, at 8500 feet, the air is smooth and cool. As we fly toward Knoxville, repeated chance encounters with the Ohio River seem to suggest that we are zigzagging wildly across the landscape. In fact, we are true to our 210° course. It is the river that follows a meandering path across the countryside. Indianapolis Center keeps tabs on us as we fly into Kentucky, but we are soon receiving radar services from Huntington approach. Farther south, we depart Huntington's radar coverage area and return to Indianapolis Center. As we fly over it, we take special note of Big Sandy Regional, the airport we intend to use as a meal stop on the way home. Terraces cut into the terrain along a road in Kentucky. As we approach Virginia, we can see Pine Mountain. It is more of an extended ridge than a mountain, a wall that runs vaguely east-west across the terrain. Although the ridge passes 4000 feet beneath the belly of Warrior 481, we are nevertheless jostled by updrafts from the curtain of rock below. A couple of the buffets are abrupt and Kristy gasps from the back seat, but we soldier on. As the trip continues, I can see her tolerance to bumps increasing, even if that tolerance is developing at a slower pace than mine. For her part, The Bear is completely unperturbed by the atmospheric conditions. I cannot help but compare the mountains below to those I have flown near in the past. They are diminutive, even compared to the Adirondacks. But they have a distinctive, layered look about them that the Adirondacks and Rockies lack. As a flatlander, I had always assumed that a mountain was a mountain. But flying over various ranges reveals that each one has its own character, a unique quality differentiated by more than obvious things like elevation. Beyond these smaller mountains, we can see the Great Smokey Mountains to the southeast. They rise like battlements, looming over the landscape at 7000 feet. We can see what appears to be smoke billowing from a valley within the range's perimeter. We assume that this is merely the Smokey Mountains doing their thing rather than an outright forest fire. Indianapolis Center switches us to Atlanta Center. We stay with Atlanta just for a few minutes before being passed to Knoxville Approach. 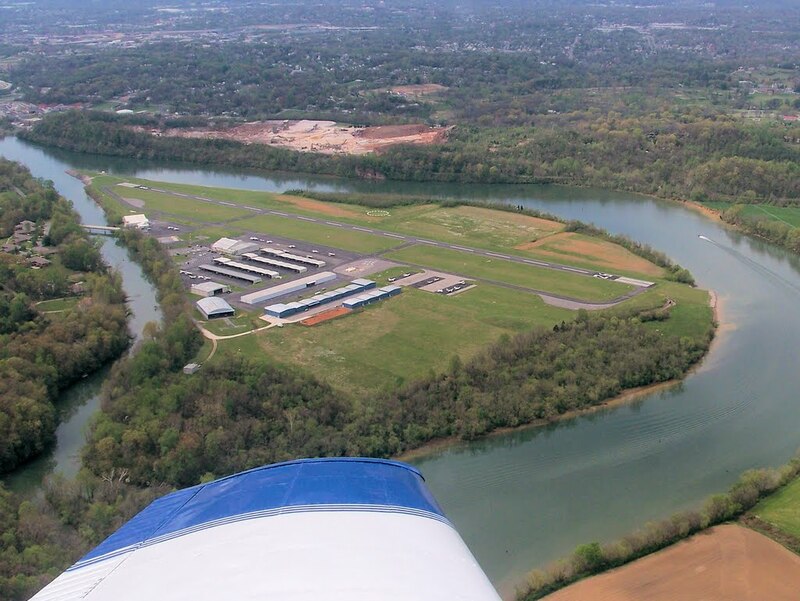 Before long, we can see Downtown Island Airport sitting in the middle of the Tennessee River. Turning final I am incredulous to discover that I am too high. I initiate a full forward slip and mutter a "hope we can land on the runway" comment that, contrary to its intent, breaks the squelch on the intercom and makes its way to Kristy's ears. But we easily make the runway, landing lightly on the main gear. I can see my dad and stepmom standing on the ramp near the terminal building. As we taxi to the ramp, I am reminded by Kristy that comments about not making the runway are not welcome. This also goes for any comments fitting the form, "oh, [insert expletive here]". On the bright side, it is 2:35 pm and we are right on time. My dad, who has never seen me fly before, makes a positive comment about the landing. Then adds that he thought we were going to land on the taxiway instead of the runway. "That's because I was high and we were flying sideways to lose altitude," I explain. From the other side of the airplane, my stepmom chimes in, "I told you he was high, Charlie!" On left base for runway 8 at Knoxville Downtown Island Airport. Photo by Kristy. Despite her generally warm and outgoing disposition, The Bear becomes amazingly shy when confronted by new people. Even in mid-laugh, the appearance of someone unfamiliar is enough to freeze her in place, reminding me of the kamikaze squirrels in my old Flint, MI neighborhood that used to dart out in front of my car only to stop and gape at the approaching front grill. My stepmother climbs on the wing and peers in at The Bear through the open door. Kristy warns her that The Bear might be a little reserved at first. Instead, The Bear extends her hand to my stepmother, climbs out onto the wing with her, and the two of them wander off toward the shade of the terminal building as fast friends. Our visit is off to a great start. In fact, the visit goes wonderfully. The Bear is clearly amused by her grandparents and they are clearly amused by her. She explores their house with impunity under the smiling eyes of my stepmother who delights in the small details of what captures The Bear's attention and what does not. My dad is a bit more reticent, watching from a distance until he decides that he is comfortable with the toddling visitor. I am amused by this; grandfather and granddaughter watching each other warily and then warming to one another. In this respect, they are very much alike. That night, The Bear goes to bed near her usual time and with little fussing. All is well until 3:00 am, when she awakens screaming in the night. Kristy picks her up from the travel bed and brings her back to our bed. The Bear quiets for a moment. Then I hear a lurching sound, a gurgle, and suddenly there is something wet on my hand. Switching on the light reveals the wetness to be partially digested fruit from that afternoon. We quietly clean this mess, but it is only the first in a series of four episodes. My wife, understanding that I will need enough sleep to fly home the next day, orders me back to bed while she rocks The Bear to sleep in the living room. Even so, I only manage about five hours of sleep that night. About 2:00 pm the next day, we return to the airport. My dad follows behind me as I conduct the pre-flight inspection. Never one to pass on a bargain, I had filled the tanks at $3.24 a gallon upon our arrival the previous day. A round of hugs are exchanged and we clamber back into Warrior 481 to begin our journey home. My last view of the happy grandparents is of them walking across the ramp to the terminal building, hand in hand. As I prepare to start the engine, I look across the cowling and notice a yellow patina covering the Warrior's skin. We are covered in Tennessee pollen and, like a huge aluminum bee, we were going to carry enough of it back to Western New York to pollinate the entire region. Although the Downtown Island Airport was quiet for our arrival on Friday, it is quiet no longer. We are third in a line of four aircraft waiting to depart. Immediately before we launch, a Citabria comes slipping sideways on final. It is a dead-ringer for the one in which I had my first light aircraft ride almost nine years previous. 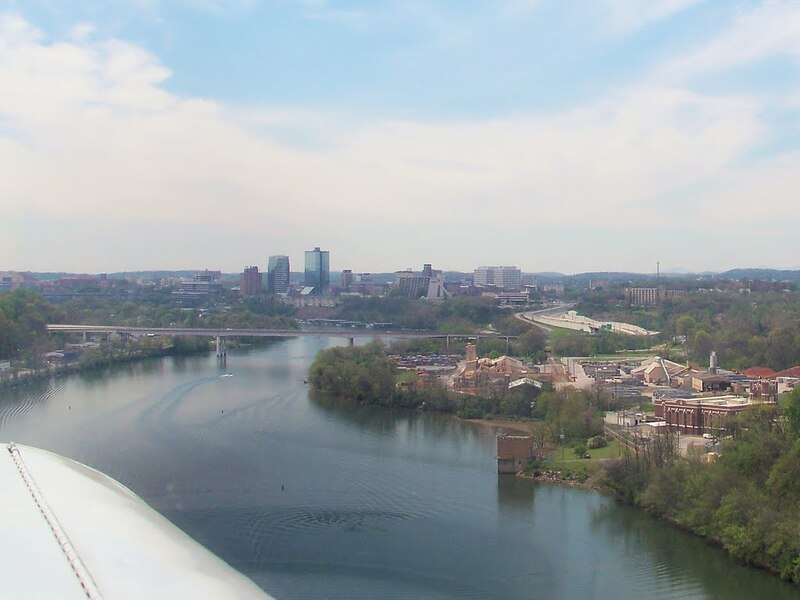 We depart runway 26 with the nose pointed directly at downtown Knoxville. Already, something is amiss. The GPS is unable to achieve a satellite lock. This means that no position data are available to us: my navigational crutch is gone and we are a long way from home. Ok, this is not a big deal, I think to myself. Inconvenient, perhaps, but the danger of getting completely lost is negligible. I have radio navigation (VOR) on board and a stack of current charts that are already open and ready for use. As we climb to our planned cruise altitude of 7500 feet, I keep Warrior 481 on a 030° heading, reciprocal to the heading we maintained the previous day. We fly nearly twenty miles with no satellite lock for the GPS. I suspect the cause of the failure to be the flimsy connection between the GPS and its remote antenna. But the GPS is of little concern. 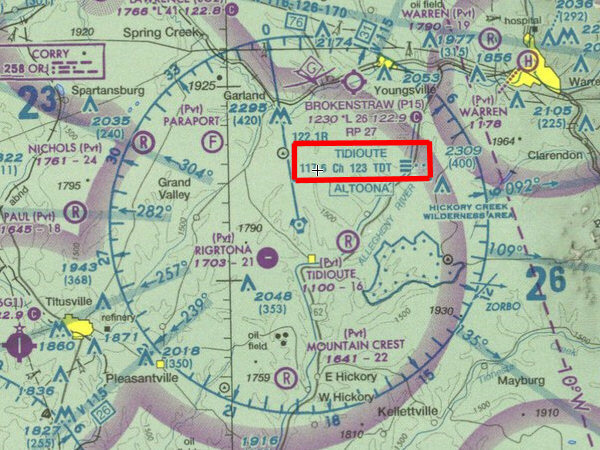 From the sectional chart, I can see that we should be near Tazewell, TN, with the New Tazewell airport just southeast of town. I can not see the airport at first and and begin to worry that we are not where I think we are. This unsettled feeling is fleeting; dropping the wing in a left turn reveals the missing airport to be directly below. Our objective is Big Sandy Regional Airport for a late lunch / early dinner. It is about an hour's flight from Knoxville. The sectional chart shows some nondescript terrain en route to Big Sandy; it will be difficult to find useful markers to navigate there by pilotage. However, it is on the 55° radial from the Hazard VOR. I walk my thumbs across the chart and estimate 35 nautical miles between the radio beacon and our destination. It will not be a particularly direct route, but the VOR will help assure that we are not drifting off course. Perhaps the entire flight home will require jumping from VOR to VOR rather than the GPS-direct routes we typically fly. I turn to a heading of 020° to track to the Hazard VOR. While tracking the VOR, we reach our cruise altitude of 7500 feet. I level the airplane, adjust the mixture, and enjoy a relaxed moment of reduced workload. The airplane is in a state of aerodynamic equilibrium, our course is set, and I know our location despite the GPS failure. Though we are well above the mountains, Warrior 481 is still being shaken by turbulent air sent skyward by the vertical terrain below. I resume a full power climb to 9500 feet in search of smoother air. At the new altitude, with the airplane trimmed and leaned for cruise, I take a moment to check on my back seat passengers. The Bear is completely asleep, a condition often brought on by the very same turbulence that makes Kristy clutch the bottom of her seat. "Shall we just skip Big Sandy and let her sleep?" I ask. Kristy nods in response. "Stop again at Parkersburg?" Again Kristy gives nonverbal approval. Departing the Mid-Ohio Valley Regional Airport, Parkersburg, WV. On a whim, I pull the GPS out of its yoke-mount and place it on the glare shield over the instrument panel where its internal antenna has an unfettered view of the sky. It locks on almost immediately. I bring it back down to where I can read it and am delighted to find that, once locked, it maintains the lock without the remote antenna plugged in. With this discovery, I scrap my plan to fly home via VORs and opt for my usual mode of cross checking the GPS with a paper sectional chart. Over Big Sandy Regional, I contact Indianapolis Center and resume radar advisories for the remaining hour to Parkersburg, West Virginia. The flight northeast is quiet, both on the radio and on the intercom as Kristy dozes in the back. Despite being at 9500 feet, we continue to experience weak thermal activity and cycle up and down slowly between 9300 and 9500 feet. 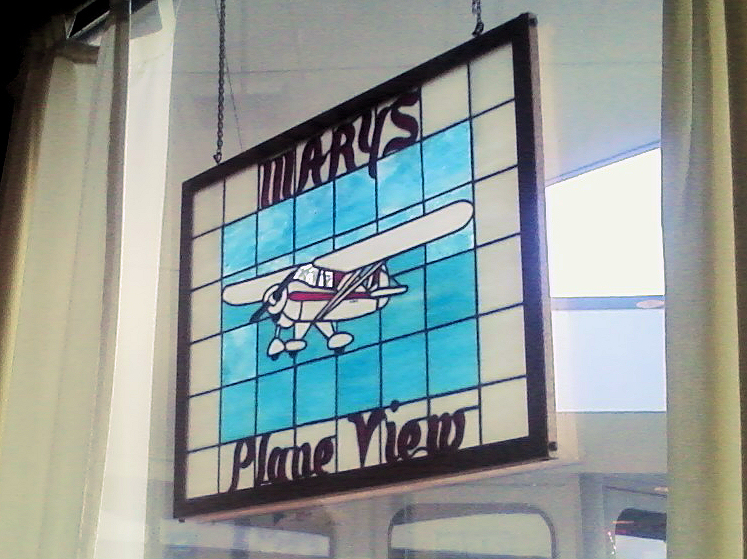 Soon enough, we are back at Parkersburg and dining again at Mary's Plane View. Kristy and I both order turkey club sandwiches for dinner (the "NDB Approach"). We are impressed to discover our sandwiches stuffed with chunks of meat cut directly from a turkey breast rather than the cold cuts we expected. It is like a homemade, post-Thanksgiving treat. Good stuff. On the way back to the airplane, The Bear points to another blue and white Cherokee parked on the ramp and tentatively questions, "me?" "No sweetie, your airplane is over there." Kristy points to Warrior 481 parked in a different area of the ramp. Seeing our Warrior, The Bear points and enthusiastically bellows, "me, me, me!" Even at 22 months old, The Bear knows her airplane. Nuclear plant near Salt Run, OH. On leaving Parkersburg, we resume VFR flight following with Indianapolis Center and eventually transfer to Cleveland Center. The Bear is wide awake for the ride home and Kristy does her best to entertain. Nearing Pennsylvania, we are transferred to Pittsburgh approach. "Warrior 481, I show your destination as 5G0. Where is that?" "Le Roy, New York," I answer, my voice ringing with pride about my little home airport. "Near Rochester." "Thanks," he responds. I am unsurprised that the Pittsburgh controller is unfamiliar with Le Roy. With a 2600 foot long runway, it is simply not an option for most of the heavy aircraft thundering through Pittsburgh's airspace. Flying over Pittsburgh's Class Bravo airspace, we have an excellent view of the massive airport below. It is actually my first time flying so close to an airport this large Not that I have been avoiding such places, but I never had any reason to be so close to one. North of Pittsburgh and back with Cleveland Center, radio chatter is virtually nonexistent. We fly so long without hearing anything on the radio that I wonder if we are out of range and have missed a hand-off to the next sector. But no, soon enough, we hear, "Warrior 481, contact Cleveland Center on 124.32, g'day." Switching to the new frequency is anticlimactic. The new sector is just as quiet as the previous. I look behind to observe The Bear industriously scribbling first in, then on the cover of, her coloring book. I have to give The Bear a lot of credit. She sometimes resists wearing her headset when we fly, but she wore it all the way home without complaint. As we reach the Allegheny and Seneca Reservoirs near the Pennsylvania / New York state line, I am getting sore from sitting still too long. With the sun hanging low over the western edge of the world, the dead landscape is enflamed with a crimson tint and, for a time, the view outside the window distracts from my aching posterior. Perhaps Warrior 481 needs a seat upgrade. Halfway between the state line and Le Roy, Warrior 481 slips under the high overcast that had been predicted in every forecast since I began planning the trip. It's nice to know that, sometimes, the weather-guessers get it right. The overcast creates a hazy gloom over northwest New York. We are grateful to Rochester Approach for helping us avoid an invisible Cherokee lurking nearby. Once the other aircraft is no longer a factor, we descend toward Le Roy. After flying nearly five hours in mostly calm air, we are surprised to find the airspace around Le Roy littered with potholes. Bumping through the pattern, we turn final for runway 28 and see a dirt runway extending from the threshold of the existing pavement. Le Roy's runway extension is finally beginning to take shape in an explicitly obvious way. The windsock ("tock") shows a right crosswind and I dip a wing, gently apply some left rudder, and we wobble through the remaining bumps down to the runway. With a squeak, we are rolling smoothly on the pavement. As Kristy and The Bear unpack the Warrior, I clean the bugs off the wings and log the time. 10.0 hours on the tachometer for the round trip, our longest airplane journey to date as a family of three. There are a lot of people who cling to the surface of the Earth, who do not understand those of us who fly. They fail to see the allure of drifting above the planet, of manipulating the winds with manmade wings, of navigating from place to place in a medium where there are no tangible roads. They do not see how airplanes bring people together. Most adventures end with a tally of technical accomplishments: hours logged, new places visited, and new experiences. As I reflect on the outcome of this journey, the greatest satisfaction comes from strengthening a family connection halfway across the country. To the non-believers, I say this: sometimes, only an airplane will do. I took the Warrior out for a sightseeing trip on Sunday afternoon with no particular goal in mind. I launched from Le Roy and contacted Rochester approach moments before puncturing the imaginary ring of their airspace hovering five miles to the northeast between 2100 and 4600'. I climbed to 5500', placing me just above the haze layer. The helpful controller at Rochester called a couple of traffic targets out to me that I never had any hope of seeing. One was a Bonanza that was five miles ahead and traveling the same direction I was. Before long, the controller notified me that the faster aircraft was "not a factor". After a brief time spent with Syracuse approach, I shunned the watchful eye of radar and landed at the Oswego County Airport. To my delight, I discovered that a new restaurant had opened on the field. I departed the airport and made for the lakeshore. 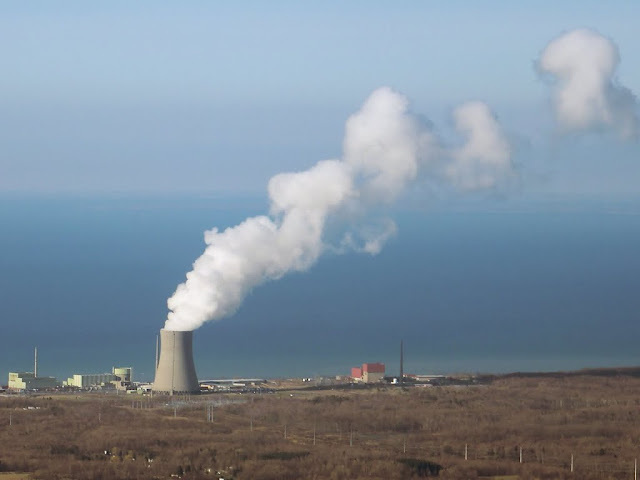 This is a nuclear power plant in Oswego. Yes, pilots are supposed to avoid flying in the airspace near power plants. I kept my distance and let the zoom lens of the camera bring the plant to me. 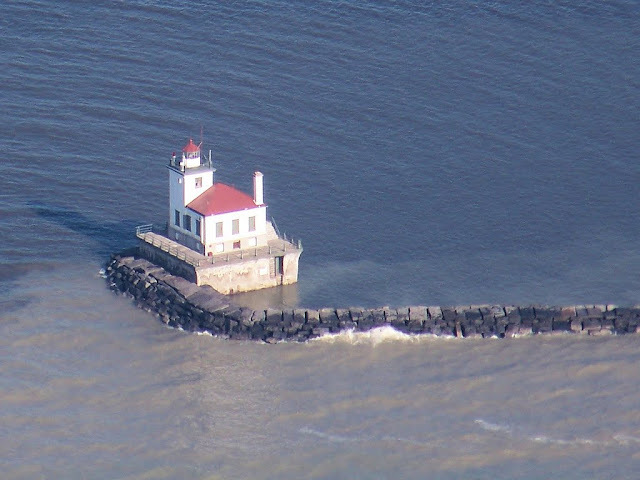 The outlet of the Oswego River into Lake Ontario is marked by an impressive lighthouse at the end of a stony breakwater. With its proximity to the power plants, I was never comfortable getting close enough to photograph it until having a high zoom camera available to me. As shown here, the Owego Lighthouse is quite a substantial structure. Back at Le Roy, I recorded the day's flight in my logbook and discovered that I had logged my 700th flight hour today.